I just got home from planning my fiftieth reunion at Oberlin College. I owe pretty much everything I am politically and professionally to the place, so I do what I can to help the place. In this case, I had three sets of reactions on the six hour drive that my hybrid and I had coming home last night that seemed worth sharing . The personal first. The professional second. Both get me to a third point I picked up from Gary Bolles who will follow my classmates and I into Oberlin in a week or so. We went to college during another period of deep division in this country, and sometimes it felt that Oberlin was at the center of the storm—at least in our late adolescent eyes. The parallels to those days, of course, were eerily obvious whenever we turned on the television or checked our news apps this weekend. There was a lot of talk about focusing our reunion on the political contrasts between then and now. We’ll probably do something along those lines. However, we decided not to base the event on that. That’s especially true for those of us were activists then and have carried that over into our careers. As we dug deeper into what we could or should do, topics like activism then and now fell down on our list of priorities. Instead, two themes grabbed us. First, if we are going to talk about activism, it only makes sense to talk about 2019 and what we can do to deal with the erosion of democratic norms and other signs of political decay. Second, we quickly realized that we wanted to talk about a lot more than activism, however important it was then and is now. Ours was a remarkable time to be in college. Even more importantly, our classmates have grown in remarkable ways, and have done so often in ways that did not reflect where we stood on the war in Vietnam and other issues. So, we decided to focus on who we are and who we will become as people. We’ll continue a twenty five year old tradition of having men’s and women’s breakfasts. We will do something on activism, but do it in a way that focuses on what we all are thinking and doing rather than having a few of us pontificate. Or course, we’ll have to talk about aging but hopefully we’ll focus on how we can live the rest of our lives as constructively as possible. We have been asked to start a tradition in which the fiftieth reunion class will give the graduating class a document with our advice for those young people whose hair color isn’t challenged yet. At our final session, we decided to ask them to give us their advice, too. What do they expect of our generation, some of whom are the same age as their grandparents. 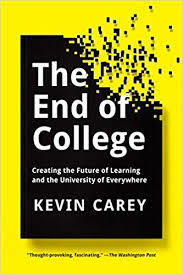 The weekend was even more disruptive for me, because I’m pretty down on higher education today for reasons that have been chronicled in books like Kevin Carey’s The End Of College or Gary Lukianoff and Jonathan Haidt’s The Coddling of the American Mind. Given its politics and its liberal arts tradition, Oberlin often figures in those discussions. That means I normally arrive on campus expecting to be grumpy professionally. But then, both the college staff and, especially, its students break my out of my grumpiness. The administration obviously puts its best foot forward at these events. But, even knowing that, it is doing some really cool things. Interdisciplinary studies including what my techie friends would recognize as a design lab. A real emphasis on helping students think about how their course of study hangs together. Even more importantly as the costs of college rise, they are doing a much better job than they used to at helping students see how their four years in rural Ohio can lead to exciting and even prosperous careers. 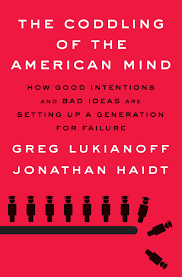 Many of us sat in on classes that left us resentful that ours weren’t that good back in the day. Even more exciting were the formal and informal times we spent with today’s students who, frankly, get a bum rap everywhere. I spent a lot of time with three young women who exemplify what today’s students can be like and how empowering they can be—and not just at Oberlin. I arrived a day early to work with some colleagues on the faculty and attend a panel discussion on Russian politics. A student who was a month into her first year came up to me afterward and had exceptional insights for a first year student into the link between cultural affairs and political life in Russia and here. I took her to lunch the next day, discovered that I had taught her father in the late 1980s, and that she is even more interesting than I realized, and I decided to help her plan her academic career. I have been working with sophomore peace and conflict studies student who also plays soccer and does some training on gender and sexual consent issues. As we talked over breakfast and at a career session with us old folks, I realized that I needed her to be a co-author of the final chapter of the textbook on peace and conflict studies Doug Irvin-Erickson and I are writing. That chapter will deal with how the readers can use what they’ve learned in the rest of their lives, professionally and personally. We can write that ourselves, but wouldn’t it be better to have the voice of a 20 year old in the book, too? So, she will help us write the chapter—and get a publication to add to her resume. My sister and her husband stopped by for lunch after our sessions ended. Since Leslie hadn’t been to campus in 25 years, I showed them around and ended up at the athletic complex where the field hockey team was playing. A woman with an Oberlin athletics sweatshirt walked by, so I asked her about women’s sports. She wasn’t playing because of injury. The discussion quickly turned to her academic work and a fellowship application she is working on that links soccer and peacebuilding. She had no way of knowing that this is something I care passionately about. We started talking sports and politics. I started telling stories about my childhood times at Brooklyn Dodger and New York Yankee games. She then excused herself to say that her father was in the stands and had to be in the conversation because he is a sports editor at the New York Times and part of my generation. I learned a lot from the father but even more from his daughter. Oh, and I’ll be helping her on her application. 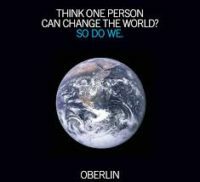 I t all comes together in Oberlin’s marketing pitch. “Think one person can change the world? We do.” The latest version of it as at the top of this post. Sometimes that comes across as little more than PR fluff. However, it does work at Oberlin. The campus DNA really does include plenty of innovation, disruption, and social responsibility. A commitment to problem solving. Constant adaptation to a world in which exponential change is the only constant. Understanding that only creative solutions will work. And they won’t work if they don’t satisfy the needs of just about everyone, so we had better be as empathetic as possible. Gary’s ideas now infuse my peacebuilding work, especially in our efforts to reach outside our professional and political silo. Oh, and he’s going to Oberlin in a couple of weeks to, among other things, meet with the senior staff. Chip Hauss is Senior Fellow for Innovation and Board Member Emeritus at the Alliance for Peacbuilding.